Did Providence find something in the second half of Tuesday’s 72-63 win over Seton Hall? Trailing by three points at halftime, and desperate for a win following an 0-3 start to conference play, Ed Cooley and his staff turned to a three guard lineup out of the locker room with David Duke, Makai-Ashton-Langford, and Maliek White all on the floor together. 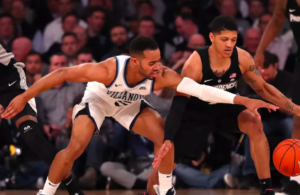 The result was increased defensive activity and an offensive pace that Providence has not played at for much of the season. After PC fell to Creighton in its Big East opener, Cooley noted how the Bluejays drew energy from their offense. Cooley wanted his group to find its energy off of defensive execution. That energy came from a variety of sources in the first eight minutes of the second half. Take Maliek White, for example. The junior shot just 3-11 from the field, but was he ever active early in the second half defensively. In my games notes I had him down for an intercepted pass at the 19:28 mark, a block from behind at 18:28, jarring the ball loose at 16:55, playing a passing lane and tipping the ball away as the shot clock expired at 16:43, and a strip that led to an Ashton-Langford layup at 14:26. Seton Hall finished with 22 turnovers on the night, and as a result we saw Providence getting into early offense. 16:08 — Ashton-Langford finds a cutting Alpha Diallo for a layup with 25 seconds remaining on the shot clock. 14:55 — Ashton-Langford looks ahead to Duke who buries a 3-pointer three seconds into the shot clock to put PC up 40-38. 14:26 — The aforementioned White steal that led to an Ashton-Langford layup three seconds into the shot clock. 13:55 — Duke finds White for a great look at a 3 that misses. That shot was taken with 25 on the shot clock. 12:55 — Duke knocks down another 3-pointer with 25 seconds left on the shot clock. It was early offense like we haven’t seen all season. Duke and Ashton-Langford began buzzing on defense as the pace picked up. Duke broke up a two on one opportunity, tipping away a pass that Ashton-Langford dove to save along the baseline on one sequence. A minute later Duke and Ashton-Langford swarmed Seton Hall big man Taurean Thompson leading to a mismatch on the other end, as the 6’2 Myles Powell was forced to cover Nate Watson in the post as the Hall scrambled back. 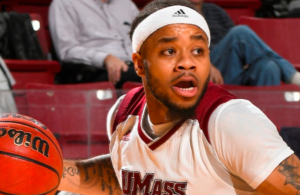 Ashton-Langford came out of nowhere to knock a Seton Hall post entry pass out of bounds. Depending upon the matchup, early offense may be critical until AJ Reeves returns from an injured foot. 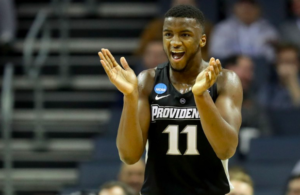 Since conference play began, and defenses stiffened, Providence’s veterans have struggled to connect from deep and spread the floor. White, Diallo, and Isaiah Jackson have all shot below 30% from 3-point range in Big East games, combining to shoot 9-49 (18%) in four league games. Those numbers will certainly rise, but until they do turning defense into early offense will be essential. Lost in the craziness of the Georgetown game from last weekend was the success with which Watson and Kalif Young beat Hoya big man Jessie Govan up the floor in the first half. They simply ran harder and faster than him — a big reason why PC built a double figure advantage. More early offense. Another benefit of playing Ashton-Langford, White, and Duke together is how it freed Duke to look for his offense. 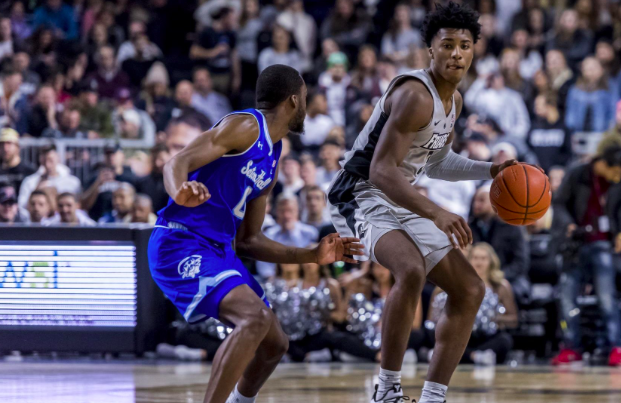 The Friar freshman played his best game since he led PC over South Carolina at Mohegan Sun in November, scoring 16 of his 18 points in the second half. Talk about efficiency, Duke scored those 18 points on just seven shots from the field (4-7 FG, 3-3 from 3, 7-8 at the free throw line). Duke exploded onto the prep scene a little over two years ago playing on a Cushing team that squeezed the life out of opponents defensively and turned its defense into easy opportunities — similar to what Providence forced Seton Hall into for the opening ten minutes of the second half. Duke was a terror on that team. He played off of the ball for large portions of his first prep season and his game looked a lot like what we saw Tuesday night at the Dunk. He stepped into good looks at 3, got to the foul line, finished when he was there, and he took the ball to the rim with authority. Duke missed a reverse dunk attempt on Tuesday night, but it was an encouraging sign that he rose up with such force. Cooley also flashed Duke in the middle of PC’s zone offense when the Hall switch to 2-3 around the 12 minute mark of the second half. Duke dribbled his way to the rim and finished a tough shot over Pirate big man Michael Nzei. Ashton-Langford also thrived when the pace picked up, as all five of his assists came in the second half. It wasn’t all pretty for PC. They put the game away on two opportunistic possessions. Young grabbed an offensive rebound on a 30 foot desperation heave from Ashton-Langford with just under four minutes to play, and PC sealed it when Diallo (15 points, 8 rebounds, 5 assists) grabbed an offensive rebound for a layup and a foul with 1:54 left to all but end it. Regardless, Cooley’s team drew its energy from its defense and got a much-needed win. The first half saw a team in dysfunction. Shot clock expiring 2X and Duke again lost in half court offense. Nichols still has no idea after starting the year aggressively on the board and defensively. Munroe showed hustle, excellent D and a great shot. Was surprised he had no minutes in the 2nd half. Totally different team in the 2nd half: crowd came alive and stayed that way throughout the final 20 min. Langford diving to make a save & playing great D and looking for the open man. Duke was super, actually looking at the basket for his offense & super D as well. Great game, great Friar win! GOFRIARS!!! !